Increases accounted for nearly 2,000 more deaths in 2017. 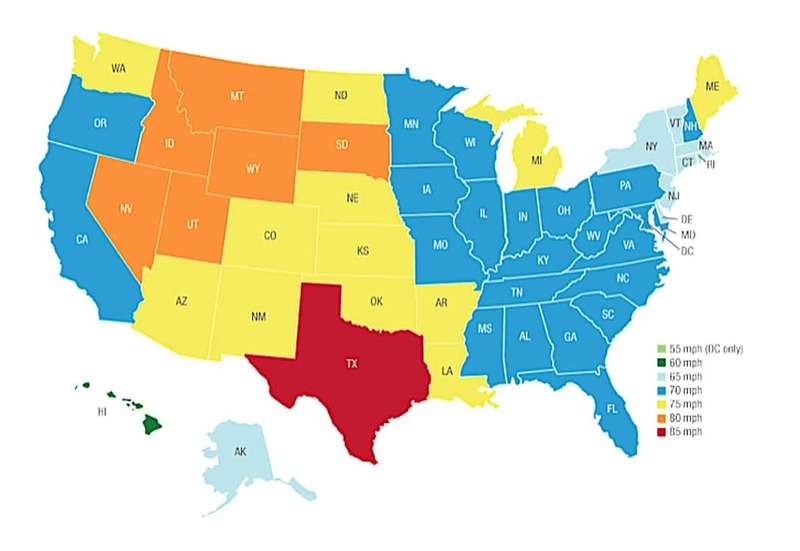 There are now 41 states with highway speeds higher than 70 mph. Improvements in the safety of new vehicles such as stronger materials, better designs and new technology haven’t been enough to offset the effect of increased speed limits on traffic fatalities. 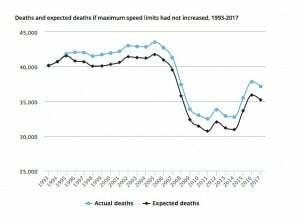 Higher speed limited can be tied to the deaths of nearly 37,000 people during the last 25 years, according to new research by the Insurance Institute for Highway Safety. In 2017, 1,934 were killed because of increased speed limits, IIHS found. 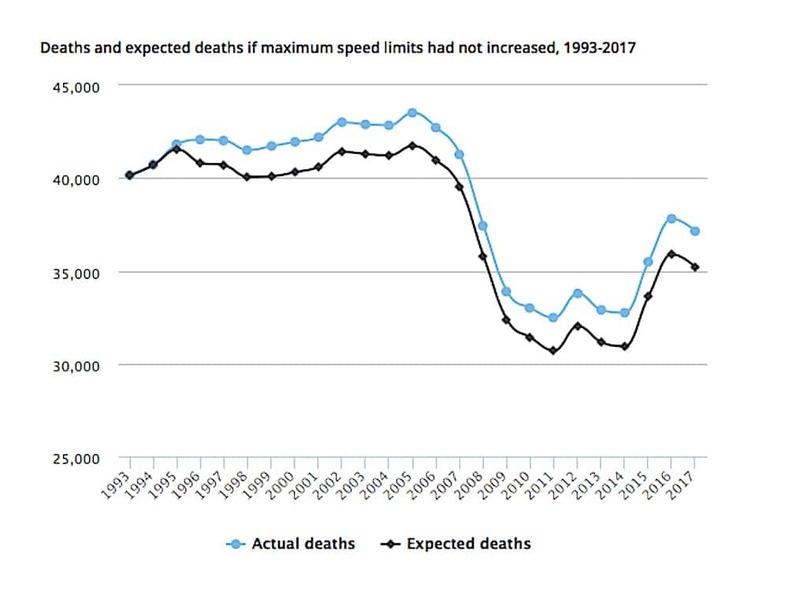 The study found a 5 mph increase in the speed limit causes an 8% increase in death rates on interstates and freeways, and a 3% increase in fatalities on other roads. The research, an update of a 2016 analysis, calls attention to the trade-off between a few minutes of saved travel time and the increased risk of fatalities. It comes as IIHS and the Governors Highway Safety Association prepare to host a forum on the speed problem. The IIHS' latest study suggests that raising the speed limit also increases traffic fatalities. “Speeding has become almost a forgotten issue in traffic safety discussions, and clearly we’re losing any sense of limits,” said Darrin Grondel, chair of GHSA’s Executive Board and director of the Washington Traffic Safety Commission. The National Highway Traffic Safety Administration reported that 9,717 people were killed in 2017 in crashes that involved speeding, accounting for more than 1 in 4 deaths on the road. Texas leads the nation with the highest speed limit: 85 mph on some roads. Six states have roads with a speed limit of 80 mph. In all, there are 41 states with speed limits of at least 70 mph. The study suggests that the rationalization that raising speed limits just merges the law with reality since most drivers already speed, is not true. In fact, it only gives drivers a license to drive even faster that they had been. This entry was posted on Monday, April 8th, 2019 at and is filed under Advocacy Groups, Automakers, Automobiles, Business, Markets, Safety, Traffic Fatalities, U.S./North America. You can follow any responses to this entry through the RSS 2.0 feed. You can leave a response, or trackback from your own site. I think the problem is speed differentials. People who want to drive fast need to change lanes frequently because of the slow drivers in the left lanes. If the police enforced having slower drivers drive on the right, the fast drivers could drive in the left lanes without having to get around the slow pokes. I find it interesting that while pedestrian deaths over the last 10 or more years have more than doubled from 3500 to more than 6000 per year, the IIHS can’t stop talking about the posted speed limits. The fact is that when speed limits were increased in 1996, the number of fatalities on American highways remained constant. In 2006, they began dropping. Over the last couple of years speed limits have largely not changed, yet fatalities have been increasing on all categories of roadway. The reason? Higher crash rates due to road capacity issues and increased levels of driver distraction due to the increased use of touch screens and higher car belt lines, limiting visibility. The IIHS should examine its own role in the recent spike in highway fatalities over the last 4 years. Mandated changes to automobile design supported by the insurance industry over the last 10 years have not been reviewed.